I’m a little surprised there isn’t a real class of dinosaur called regisaurs. The regi- part sounds like it might be derived from “regal”, and there are plenty of dinosaurs that it would make sense to describe as such. Ixalan’s regisaurs seem to be something like tyrannosaurs or allosaurs, the kind of creatures you would not want to look in the eye (just like you’re not supposed to with the Queen of England). This particular member of the species was clearly intended to interact with the enrage ability in limited, but its applications go far, far beyond that. Depending on the scenario, it can also force damage through to players and planeswalkers (basically uncounterably, too – watch out for Trickbind), and like with Curious Obsession, I like how its design reminds us not to hang back. I’d even try it in a non-dinosaur-centric deck. It’s not quite as brutal as Rumbling Slum because it’s turned off by things that prevent it from attacking, but the Slum is a very high bar that’s almost unfair to use as a comparison. 4 /4 for 4? Sign me up. Raging Regisaur fits nicely into that 4 mana dinosaur sweet spot. Curve aside, this lizard also has a great ability. Whether its killing chump blockers, melting your opponents life, or activating Enrage triggers, you’ll want to swing with this guy as much as possible. It might be hard to fit Raging Regisaur into a Naya Dino deck, but it is a strong contender in a Gruul deck. Talk about aggressively costed. Raging Regisaur is a solid body with an upside: you ping something every time it attacks. This includes your own creatures, which may or may not have Enrage triggers. 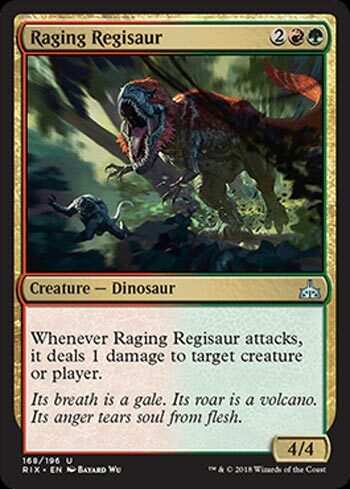 For that reason alone, Raging Regisaur is an integral part of the Dinosaur archetype in Limited, but it can put in work by picking off X/1 creatures, holding down planeswalkers, or getting in that extra lethal point of damage. It’s not Rivals of Ixalan‘s best uncommon, but it’s a good part to a strong tribe.